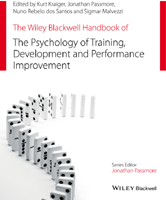 The Wiley Blackwell Handbook of the Psychology of Training, Development, and Performance Improvement provides up-to-date, contemporary information for researchers and professionals by reviewing the latest literature and research in the interconnected fields of training, development, and performance appraisal. It brings a psychological perspective to bear on a multi-disciplinary field that links to management, human resources, and education. Why the Psychology of Training, Development, and Performance Improvement? Learning Spaces at Work: From Work and Training to Learning? Conceptual Background: What is Active Learning? Mechanisms of Active Training: What Do We Know about Why it Works? Evidence on Aptitude-Treatment Interactions (ATI): Who Benefits Most from Active Training? Virtual Environments, Blended Learning, or Hybrid Systems? What is Meant by Effectiveness with Respect to VLEs? What is a Personal Development Plan? What are the Necessary Conditions to Make the PDP Work?